The ESI RQ motor controls allow users to control their motorized shades through the ClareHome system. The RS232 serial commands operate controls through a single data string. In addition, RQ controls can specify any intermediate position from 0% to 99%, giving precise control. The RQ includes bi-directional capabilities that are built into the controller. The feedback provided to the ClareHome system includes a confirmation the controller received a command, the connected device’s starting position, a report when the product arrives at the desired destination, to confirm programming changes, and when queried for data. With the use of this feedback in automation systems, integrators can animate interfaces with movement and confirm the position status of the products being controlled regardless of the type or number of connected systems. Shade settings can be controlled via events. Use Fusion’s Scenes and Rules to automate the actions your customers want. The following figure shows the ESI RQ controls in the ClareHome app. A qualified installation technician should install the ESI shade motor. Refer to the installation instructions that came with your ESI equipment. Note: When installing the equipment, your technician must assign each shade motor a numeric address. Please have the technician note the numbers he or she assigns. You will need this number when integrating then shade motor in Fusion. 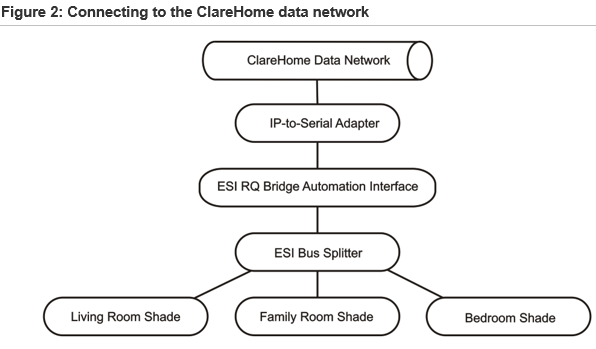 After installing the ESI RQ shade motor, connect it to the ClareHome data network. To make the connection, you will need an IP-to-Serial adapter, such as a Global Cache’ iTach device. You will also need an ESI RQ Bridge Automation Interface device and the ESI Bus Splitter device, if you are installing multiple shade motors. 1. Attach one end of a Cat 5 networking cable to a port on the ClareHome data network, and then attach the other end of the cable to RJ-45 jack on the IP-to-Serial adapter. See Figure 2. 2. Using an RS-232 cable, connect the IP-to-Serial device (Global Caché iTach) to the ESI RQ Bridge Automation Interface device. 3. Using an RJ11 cable, connect the ESI RQ Bridge to the ESI Bus Splitter. Note: If you are only installing one shade motor, you do not need the ESI splitter. You can connect the shade motor directly to the ESI RQ Bridge. 4. Connect the ESI Bus Splitter to the ESI RQ motors for the shades in your project. 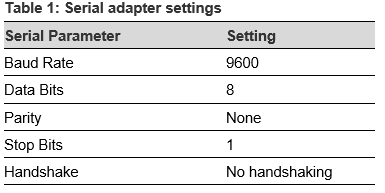 To ensure proper communication between the ESI RQ shade motor and the ClareHome system, you must configure your IP-to-Serial adapter with the following settings. Be sure to follow the manufacturer’s instructions included with the device. Note: To configure the serial adapter, follow the manufacturer’s instructions included with the device. Once you have installed your ESI RQ shade motor, you must add and configure it in Fusion. This includes defining the parent and child devices. Follow the steps below to configure your ESI RQ shade motor in Fusion. 1. Click the Devices tab, and then click the New Device button to display the Select Template dialog. 2. 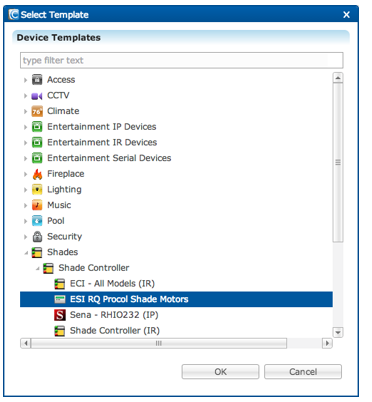 Expand the Shades folder, and then select ESI RQ Procol Shade Motors from the list. 3. In the Device Wizard, enter the number of shade motors that you are adding to your project, and then click OK.
4. In the Details tab’s Name field, enter a name for your ESI RQ parent device. 5. Click the Configuration tab. Network Address: The device’s IP address. Network Port: The serial port number for the IP-to-Serial device connecting the ESI RQ shade motor with the ClareHome data network. Once you have created your shade motors, you must name them. 1. Return to the Devices tab, and then double-click the first shade motor to display its Details tab. 2. Enter a name for this shade motor. 3. Click the Configure tab, and then in the Value field, enter the shade motor’s number. 4. Repeat steps 1 through 3 for each additional shade motor in your project. 1. On the Configure tab, click the New Service Instance button to display the Create Service dialog. 2. In the Service Name field, enter a name for your service. This is the name that appears on the customer’s iDevice – for example, Living Room Shade. 3. Click Open Wizard to display the Service Instance dialog. 4. Click Shade Service, and then click Next. Fusion displays the Edit Service Instance Devices tab and auto-populates the control points. 6. Repeat steps 1 through 5 for each shade motor in your project. 7. When done, deploy your project. 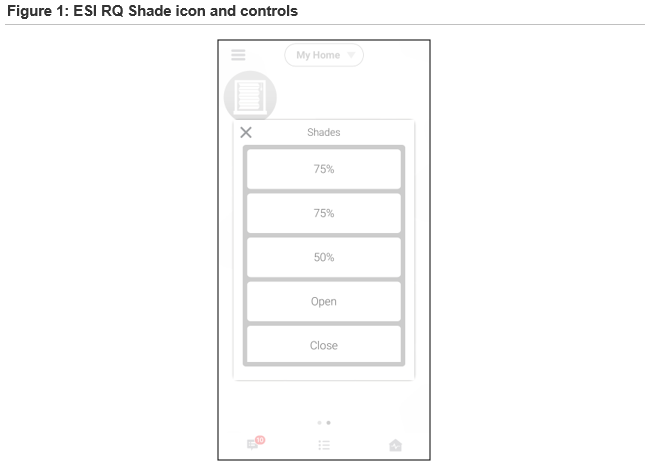 After configuring your ESI RQ shade motor in Fusion, you can create scenes that automate the actions your customers want, such as raising and lowering the shades. Use Fusion’s Scenes and Rules options to create the scenes that will render on your customers’ mobile devices. Refer to the Fusion Configuration Tool Administrator Guide (DOC ID 069) for more information about creating scenes and rules.